Why another confraternity for priests? The Confraternity of Priest Adorers of the Eucharistic Face of Jesus responds to the need and desire of many priests, young and old, to unite among themselves specifically for the adoration of the Most Blessed Sacrament, and to support one another in persevering in prayer. Its charter, so to speak, is the Priestly Prayer of Jesus at the Last Supper in the Cenacle, given in the 17th chapter of Saint John’s Gospel. Therein, Jesus the Eternal High Priest lifts His eyes to heaven and prays to His Father, firstly, for Himself; secondly, for His apostles; and thirdly, for all those who, through the word of His apostles, will come to believe in Him. The crisis that continues to shake the Church and to burden the hearts of priests with sorrow and uncertainty, requires a powerful spiritual antidote. Our Lord is calling His priests to tarry in His presence. He invites them to abide in the radiance of His Eucharistic Face, close to His Heart. There they will recover the joy of their youth and the certainty of being loved by Christ with an everlasting love. Eucharistic adoration is a wellspring of priestly happiness. It is by daily adoration that the priest begins to say, in all truth, with the psalmist: “To be near God is my happiness” (Psalm 72:28) and, “My happiness lies in Thee alone” (Psalm 15:2). There is a correlation between happiness and holiness. A priest faithful to his daily hour of adoration will, like Saint John the Baptist, be a friend of the Bridegroom, “rejoicing with joy” (John 3:29) because of the Bridegroom’s voice, and capable of winning souls for Christ. Are not such confraternities already in existence? The 19th and early 20th centuries saw, in fact, the birth of a number of movements for the promotion of Eucharistic adoration, reparation, and priestly holiness. The best known of these is, without doubt, the Association of Priest-Adorers of the Blessed Sacrament, founded by Saint Peter Julian, and canonically erected in Rome on 16 June 1887. The second half of the last century saw many of these fine movements fall into decline, leaving a void in the spiritual life of new generations of priests. The Year of the Eucharist proclaimed by Saint John Paul II in 2004, and the Year of the Priesthood proclaimed by Pope Benedict XVI in 2009 were an invitation to rediscover and refresh the benefits that accrue to priests who commit themselves to prayer for and with one another, and in particular, to Eucharistic adoration. Why the Eucharistic Face of Jesus? In his Encyclical Letter of Holy Thursday, 17 April 2003, Ecclesia de Eucharistia, Saint John Paul II drew the eyes of the Church to the Face of Christ in the Most Holy Eucharist. He coined a new phrase, one not encountered before in his writings or in the teachings of his predecessors, “the Eucharistic Face of Christ.” Thus did Saint John Paul II share with the Church his own experience of seeking, finding, and adoring the Face of Christ in the Most Holy Sacrament of the Altar. The human face is a mysterious icon of the heart. It signifies, among other things, a personal presence open to relationship with another. In the Sacrament of His Love, the Face of Christ, the Human Face of God, is turned towards those who seek Him, ready to draw them into a healing and life-giving communion of love with His Sacred Heart. Who may belong to the new Confraternity? The Confraternity of Priest Adorers of the Eucharistic Face of Jesus is open to all bishops, priests, deacons, and seminarians. What are the obligations of a Priest Adorer of the Eucharistic Face of Jesus? There is but one essential obligation: one continuous hour of adoration each day, beginning and ending with the brief prayers of the Confraternity. This obligation does not bind under pain of sin; it is, nonetheless, a serious engagement, and one not to be put aside lightly. In times of sickness, the offering of one’s weakness and suffering, in union with the immolation of the Lamb, is itself an act of adoration, reparation, and fruitful intercession for one’s brother priests. The hour of adoration may be made before the Blessed Sacrament concealed in the tabernacle, simply exposed in the ciborium, or solemnly exposed in the monstrance. One may join the Confraternity at any time. Upon joining the Confraternity, and once a year thereafter, the Priest Adorer solemnly pledges to make daily one continuous hour of Eucharistic adoration. He renews his pledge every June on the date most convenient for him, between the feasts of Corpus Christi and the Sacred Heart of Jesus. A priest may renew his pledge privately in the presence of one witness; or together with the priests of his Cenacle; or publicly before the faithful in his parish church. To remain active in the Confraternity of Priest Adorers of the Eucharistic Face of Jesus, the annual pledge of membership must be signed, dated, and returned to Silverstream Priory in Stamullen, County Meath, Ireland, no later than July 1st every year. Wherever possible, the Priest Adorers of a particular region will want to gather once a month, preferably on a Thursday — the day of the Eucharist and of the Priesthood — for a Cenacle, that is, one hour of Eucharistic adoration together, an opportunity for Confession, and a time of spiritual support and fellowship. Does the Confraternity have any particular patron saints? Yes. The patrons of the Confraternity are, first of all, Our Lady of Knock (feast 17 August), together with Saint Joseph (feast 19 March), and Saint John the Evangelist (feast 27 December); then, Saint Thérèse of the Child Jesus and of the Holy Face, virgin and Doctor of the Church (feast 1 October); Saint Peter Julian Eymard, priest (feast 2 August); Saint Gaetano Catanoso, priest (feast 20 September); Blessed Columba Marmion, priest and abbot (feast 3 October); Father William Doyle, S.J., priest (+16 August 1917); Blessed Edward Poppe (feast 10 June), and the Venerable Fulton John Sheen, bishop (+ 9 December 1979). What support will the Confraternity offer its members? Once the secretariat of the Confraternity is organised and in full operation, members will begin to receive a monthly letter from Silverstream Priory containing a text suitable for meditation in the presence of the Blessed Sacrament. They are remembered in Holy Mass on the Third Thursday of every month in Silverstream Priory, Stamullen, County Meath, Ireland. 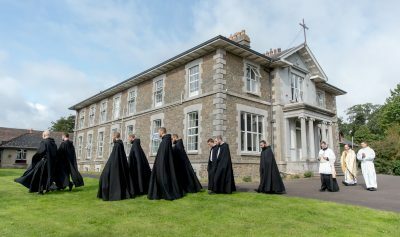 By virtue of membership in the Confraternity, Priest Adorers and Associate Adorers share in the Masses, Divine Office, Eucharistic adoration, and other prayers and works of the Benedictine Monks of Silverstream Priory, under the patronage of Our Lady of the Cenacle. May layfolk and religious participate in the Confraternity? Layfolk and religious may associate themselves to the Confraternity of Priest Adorers of the Eucharistic Face of Jesus by becoming Associate Adorers, and by renewing their membership yearly in June, on the date most convenient for them, between the feasts of Corpus Christi and the Sacred Heart of Jesus. To remain active Associate Adorers of the Eucharistic Face of Jesus, the annual pledge of membership must be signed, dated, and returned to Silverstream Priory in Stamullen, County Meath, Ireland, no later than July 1st every year.